I made a beehive cake for my son's preschool bake sale. I didn't have much time so I thought I'd choose a cake that I could put together quickly. I thought I'd easily find instructions, but although I found lots of pictures of very cute beehive cakes, I didn't find anything that took me through making one step by step. So I came up with my own approach that I'll share here. Note that I didn't need a huge cake on this occasion so I made a half beehive cake. You can make a taller cake this way (which can look more impressive) with only half the amount of cake. You can easily adapt the approach to make a full beehive cake. Here's my beehive cake. I was reasonably pleased with it for a first attempt at making this cake. I didn't have much time as I had other things to do to prepare for the bake sale and I had my three year old son watching every step and asking if there were any spare bits I didn't need. I used yellow marzipan to cover the cake as my family all love marzipan. 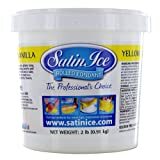 But you could use yellow fondant or gumpaste if you prefer. The marzipan bees were very popular! If you are making a full beehive cake you'll need two deep cakes - 1 large and 1 medium sized. You may choose to make two thinner cakes and layer them with jelly - I'd probably do this next time. If you are making a half beehive cake like mine, you'll just need one deep cake. Or a large and a medium thin cake each turned into a sandwich with jelly. Cut your round cake in half and put one semi circle aside. From the other half cake, cut a smaller circle - I cut around a pyrex bowl. I think a beehive cake looks better with the edges rounded. 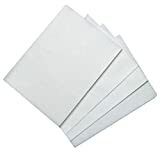 Take a knife a cut a small amount at an angle from the top and bottom rounded edges of the cakes. This gives a more rounded appearance to the cake. Now for each layer roll out a large enough piece of fondant, gumpaste or marzipan to cover the cake on the top and sides and tuck it underneath. I think this is easier and more effective than covering the whole cake in one go, and it means you can easily separate the layers to serve the cake. For the layer on the top of the cake I made a microwave cake in a small glass bowl. I used a 1 egg sponge cake. A microwaved sponge cake doesn't look particularly attractive, but it's going to be covered up anyway. For my half beehive I just cut this small cake in half. Now stack up the cakes to form a beehive. You can also dust the beehive with cocoa powder at this point. These make things much easier! 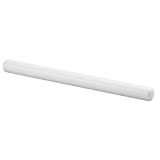 Roll balls of yellow fondant and lengthen then slightly to create bee bodies. Add small balls of white fondant for eyes and draw on pupils with a black edible ink pen. Cut out wing shapes from white edible rice paper. I cut four layers at the same time so they would all be the same. Cut diagonal slits in the body of the bees and stick in the wings so they point backwards. Roll out black fondant and cut thin strips and wrap them around the bee bodies. I put one in front and one behind the wings. Also add a smiley mouth in black edible pen. 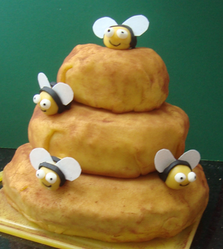 Use wooden food picks to fix the bees in place on the cake. 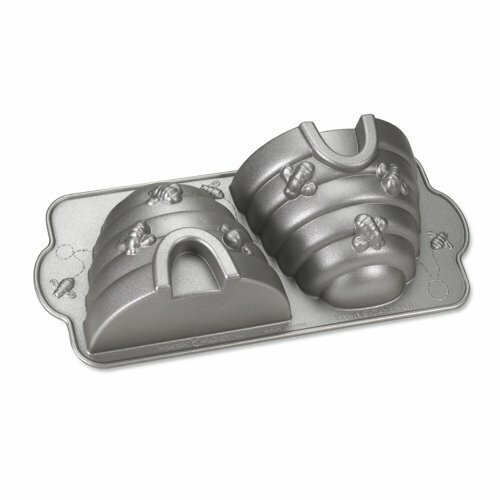 This beehive cake pan is very cute and will give a more professional look to your cake and take less time to make I'm sure. I enjoy decorating cakes, but then I have a flexible job where I work from home. I used to work full-time in the office. A shaped cake pan can be a great solution if you're pushed for time. You can also get edible sugar bee decorations to pop on your cake. 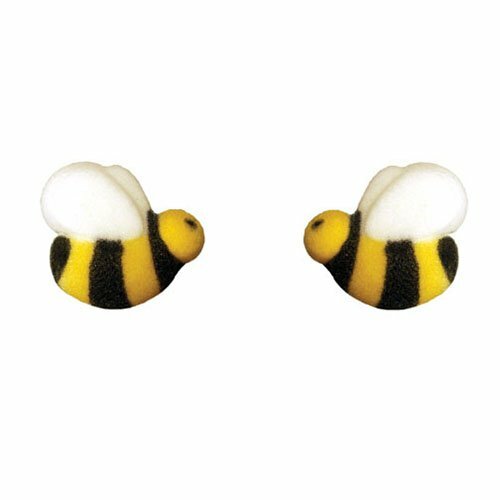 You can get some very cute bee themed party supplies that work well with a beehive cake if you're hosting a bee themed birthday party or baby shower. Bzzz. My boys love Lego Ninjago. I made this Ninjago cake with my son when he had a friend coming round for a tea party. It's very quick and easy to make, I've included instructions. Instructions for making a Pirate Island Cake with Treasure Chest. Pictures and recipe are included. Did you like the Beehive Cake? Great idea! I think I can manage this. ha ha ... this is a great cake..
My grandkids would love this. Thanks for the article. What a delightful cake...well done. Looks to good to eat! This is the cutest cake! My grandchildren will love this! Thank you for sharing! Looks yummy, and easy enough to make. I love the bees! What a cool cake. I have my own bee hives in my back yard, I was just taking pictures of my bees this morning and searched for bee articles finding this one. What refreshing new idea in cake decorating, love it! Isn't this a bee-utiful cake! It also looks delicious. Yes I think making sure everyone gets a bee is important! Thanks Marie. Yes, I was pleased with the bees. I think I'll make them as cupcake toppers next time. I think you'd need to do that for a birthday party so every child could get a bee.